Among the agricultural products that the Acadians adopted from the Amerindians were corn, beans, and squash, known to the Amerindians as "The Three Sisters". These products were the result of the companion-planting of corn, beans and squash each beneficial to the other. The sturdy corn stalk gave the beans vine support; the beans produced nitrogen for the corn and the squash nines; shaded the grounds, keeping down weeds and conserving moisture in the soil. Not only did the Amerindians plant the Three Sisters crop together, but they believed that these vegetables were supposed to be eaten together. One dish that resulted in this concept was SUCCOTASH. Traditional recipes evolved mainly from the use of foods that could be stored for the long cold Winters and every home maintained a supply of dried salt codfish, potatoes and salted pork fat and, a favourite dish was a combination of these ingredients. Some other favourites were GROSSE SOUPE (a hearty soup of beef shank, onions, herbs, beans, peas, green beans, cabbage, turnips, corn, carrots and potatoes; RAPURE (a baked casserole of a mixture of salt pork, pork fat, onions, grated and mashed potatoes); and MIOCHE AU NAVEAU (mashed potatoes and turnips). Buttered bread spread with molasses often served as dessert. Pastries and cakes were reserved for Sundays, but dishes such as pancakes (plogues) and poutines (dumplings) would be considered 'special' desserts today. Potatoes provided the staple of the Acadian diet and, boiled in meat or fish stock, made a wholesome and satisfying dish called FRICOT. They supplemented their diets with wild game such as black bear, moose, snowshoe hare (rabbits) and partridges, Canada goose, ducks, plover marsh birds and the now extinct passenger pigeon. They also fished for salt water cod, salmon, shad, stripped bass, eel, smelt and a variety of shell fish. Following the expulsion of the Acadians, those who escaped the deportation and those who returned and resettled mostly along the coastal areas, found themselves in a completely different environment that they had been accustomed... isolated culturally, the Acadians had to respond to new and different circumstances, forcing them to make the most of what they had. Unlike their forebears who had continued agrarian traditions brought from France, the resettled Acadians living by the sea, lost their agricultural and culinary traditions and put new ones in their place. By necessity, they learned to tap the rich resources of the sea. Over time, the struggle to put food on the table developed into a unique culinary tradition and imaginative response to the land and the sea. Unlike the staples of the Acadian diet, the gaspereau and shad which served as important secondary sources of protein, required less cooking but higher temperatures. Hence, fish were usually fried in oil... probably bear oil (much to the chagrin of French travelers) because butter was practically unknown in Acadia. On the whole, Acadian cooking was uncomplicated, keeping the number of ingredients to a minimum and the method of preparation simple. In fact, many dishes were a one-pot meal, such as FRICOTS and CHOWDERS. If there is one dish that could be called "typically Acadian", it would be FRICOT, which is a soup containing potatoes and meat (usually chicken), fish and/or seafood. Although a fricot may vary from one region to another, to this day the dish will always have the same basic ingredients... meat and potatoes in a hearty broth, with dumplings called poutines or grand-pères. Fricots are rich in calories and, with fresh bread... "a meal in themselves"! Fricots and poutine rapées continue to be a central part of today's Acadian cuisine, together with meat pies and paté à la rapures... followed by poutines a trous. The morning meal (breakfast) was usually the heartiest and was served after they had worked-up an appetite from the morning chores and would BOUDIN (blood pudding), CRETONS, GRILLADES and TOURTIERES (meat pies) as well as leftovers from the previous day's meals. The three meals of the day were called déjeuner (breakfast), dîner (dinner) and souper (supper). Age-old Acadian cooking techniques remained fundamentally unaltered throughout the late eighteenth century, despite radical changes in their diet. The Acadians utilized two main cooking techniques; boiling or frying in chaudrons (black cast-iron pots). Turnips and cabbages were cooked by boiling together into a "soupe de la Toussaint", an extremely popular pre-expulsion delicacy during Winter months. In general, cooking techniques for fish were quite simple... salted herbs, a combination of onions, chives and green onions cut into 1/2 inch cubes and layered with coarse sea salt and pepper in a glass crock, and boiled until a brine formed. The fresh fish (caught daily) were then simmered in this seasoned water and then fried. Except for a few dishes, frying was restricted to fish and baking was restricted to bread. Whole wheat or mixed grain bread was served at major meals, according to eighteenth century observers, and loaves were inevitably consumed with molasses and locally produced maple syrup. 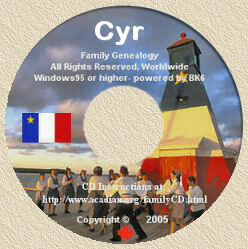 Click here to view details of the numerous "specific family" genealogy CD-ROMs, now available. An Acadian specialty, "rappie pie" is still served (usually) on Sundays and festive occasions in some parts of New Brunswick and Nova Scotia. Rapée or rapure are French terms meaning "grated". The dish consists of grated potaoes, layered with meat and broth and baked until golden brown.This dish is to the Axadians of Nova Scotia and Prince Edward Island, what "Poutine Râpée" is to the Acadians of southeastern New Brunswick... a favourite! In certain parts of New Brunswick, it is called "Pâté à la râpure, "Paté râpé" or "Chiard". While the preparation of Râpure is similar in most areas, the ingredients often vary from one region to another, or even from one family to another. Some Acadians add pork, others add chicken or seafood, while still othersuse only grated or mashed potatoes, or sometimes day-old bread. Cook fowl, onions, carrot, celery and salt in enough water to cover ingredients. Bring to a boil and skim. Simmer until meat is tender (about 2 1/2 hours). Remove skin and bones and cut meat in pieces. Strain broth. Fry salt pork until crisp. Peel potatoes; grate very fine, or purée in electric blender. Working with about 1 cup of potato at a time, squeeze it in a clean dish towel to remove as much liquid as possible (save liquid). Empty potato into large bowl (at this stage potato feels like snow). Combine half of the saved potato liquid water, to an equal amount of chicken broth, bring to boil and gradually stir into potato to mix thoroughly (potato will swell). Spread a layer of potato mixture in bottom of greased roasting pan (15 X 20 inches) and cover with a layer of chicken. Repeat layers until dish is full, ending with potato. Sprinkle with salt porl. Bake at 400°F until top starts to brown (30 minutes). Turn oven control to 350°F and continue baking until brown and crusty (2 hours). 10 to 12 servings. Cut the pork into cubes and sauté them in a frting pan. Add the onions and sauté until golden brown. Set the meat and onions aside. Grate the raw potatoes and extract the water from the potatoes by putting them in a cotton bag and sqeezing vigorously. (Note: The potatoes may first be rinsed in cold water, to remove their starchy pink colour). Placed the mashed potatoes in a large bowl with the meat, onions, grated potatoes, eggs, salt, pepper, summer savory and coriander and combine them thoroughly. Place the pork fat in a 8" (20 cm.) X 15" (35 cm.) casserole dish and pour the potatoes over the pork fat. Sprinkle with the pieces of fried salt pork. Bake at 350 degrees F. (180 degrees C.), for at least two hours, or until the top is golden brown. Variation: Substitute the pork in this recipe by chicken. Or, the two meats may be mixed together. Cut the chicken into large pieces and put them into a pot with just enough water to completely cover the meat. Add the onions and simmer until the chicken is tender. Remove the chicken from the pot, but save the chicken broth. Remove the meat from the bones and cut into small pieces. Grate the potatoes. Extract all of the water from the potatoes by putting them in a cotton bag and squeezing vigorously. Bring the chicken broth to a boil. Scald the potatoes in an amount of broth equal to two-thirds of the water extracted from the potatoes. Blend the broth with potatoes and season with salt and pepper. In a heavy pot, sauté half of the cubed salt pork. Add half of the potato mixture, the chicken and then cover with the remaining potato mixture. Cut the remaining salt pork into strips and place them on the râpure. Bake for 1 1/2 hours, or until the top is uniformly brown. Variation: The chicken may be replaced by hare, mussels or clams. For many Acadians living in southwestern New Brunswick, Poutines Rapée, a potato dumpling with a mixture of seasoned pork in the centre, is considered a national dish. In other parts of Acadia, these delicacies are prepared without meat and are sometimes added to fricot (see recipe below). Although the greyish colour and gluey testure of the poutines make them appear somewhat unappetizing, their taste more than compensates for their unattractive appearance. Extract the water from the grated potatoes, by putting them in a cotton bag and squeezing vigorously. Mix the mashed potatoes with the grated potatoes. Season with salt and pepper. Roll the potatoe mixture into a ball resembling small snowballs. Make a hole in the centre of the potato ball and add 1 tbsp. (15 ml.) of the salt pork. Close the hole and roll the poutines in flour. Gently drop the poutines, 2 or 3 at a time, into a large pot of boiling salted water, ensuring that the water is kept at a rolling boil. Simmer the poutines for 2 to 3 hours. Eat the poutines hot with butter, salt and pepper, or as a desert with sugar and molasses. Variation: In Chéticamp, Acadians make a large Poutine à la râpure, which they call Cochon en sac (Pig in a Bag). To make this simple variation, add salt, baking powder and flour to the grated potatoes. Cook the Cochon by steaming it in a large cotton bag. Serve with sugar and molasses. [Note from Yvon: I personally saw a group of Acadians enjoying the poutines, with ketchup and/or mustard]! Poutines may also be cut into slices and fried with butter. The chicken fricot is an ancestor to our chicken and dumplings and can also be made with fish, rabbit, beef, pork, game or no meat at all. The original potato fricot was prepared by early Acadians when neither meat or fish was available and was given the tongue-in-cheek name 'fricot à la belette' (weasel fricot) and, according to folklore, if you ask an Acadian about the origin of the name, they will simply smile and say... "Parc-que la bedette a passé toute droute" (because the 'weasel' [meat] went right on by)!" Place the diced turnip and carrots in a large pot. Cover the vegetables with water and bring to a boil, simmer for about 15 minutes. Add the potatoes, chopped onion, salt and pepper. Simmer for 20 minutes Cut pork into small pieces and place in a skillet with a small amount of water. Bring to a boil. Pour off the water and sauté the pork fat until it is lightly browned. Let stand. Sauté second onion until slightly browned. Add small amount of the vegetable broth to the sauté'ed onion mixture, making a smooth sauce. Add the sauté'ed pork and onion to the boiled vegetables and broth. Soupe au navet is best when served with hot rolls. In the English speaking world, the word 'soup' means any liquid food made from stock. The French have several names or terms used to describe their different types of soups, depending on the preparation. These names range from bisques, bouillon, and consomé, to potages, purées and even... soup! "Soupe De La Toussaint" was a meatless soup made with cabbage (often stolen from their neighbours garden, on Halloween), and is similar to Louisiana's traditional vegetable soup, gumbo z'herbes, that is served on Good Friday. Soak barley for 30 minutes in cold water. Add dry beans, peas and barley to the broth and simmer for 1-1/2 hours. Add raw vegetables and simmer for an additional hour. Serve the soup (or broth as first course), then the meat and vegetables. Place soup bone and water salt pepper, onions and herbs in large pot and bring to a boil. Reduce the heat and simmer on low heat for 1 hour. Chowder is a thick, soup with cubed new potatoes enriched with butter, milk and cream, flavored with a touch of chervil to which is added, fish, lobster, scallops, shrimp, etc..
chopped parsley. Serve with whole-wheat crackers or soda bread. Makes 4 generous servings. a chicken stew, it could easily be converted to a "fricot" by simply adding dumplings called "poutines" or "grands-pères", mentioned above. Soak peas in water, over night. The next day, drain the peas and then boil them in fresh clean water. Use a 4- 4 1/2 quart pot. Add onion and ham bone. Cook at "low heat" for two hours. Add diced carrots, rice, ham and cook for a further ten to fifteen minutes. Mix all dry ingredients in a large bowl, with 1 1/2 cup of cold water, until the consistency of cake batter. Add 1/2 cup of hot (not boiling) water and mix well to make a light batter. Spoon enough batter onto a very hot griddle, to make a 4 to 8 inch pancake. Serve with creton... that's _another_ story, butter, or molasses! My own personal favourite, is with maple syrup! Cook all ingredients (except pie crust), stirring constantly until meat is light brown in appearance, but still moist (about 4-5 minutes). Pour mixture into pastry-lined pie plate, cover with top crust that has slits in it. Seal and press dough firmly around edges (with a fork), Bake at 400 degrees in oven for about 35-40 minutes or until crust is golden brown. Let stand for 35-40 minutes before cutting. Note: Add ketchup to taste, when eating. Cook all ingredients together (except pie crust) stirring constantly until meat is light brown in appearance, but still moist, about 4-5 minutes. Pour mixture into pastry lined pie plate, cover with with top crust that has slits in it. Seal and press firmly around edges with a fork. Bake at 400 degree in oven for about 35 to 40 minutes, until crust is golden brown. Let stand for 35 to 40 minutes before cutting. Prepare enough pastry for a double-crust pie and one egg yolk beaten with 1 tbsp. water (for glazing). Combine all ingredients (except pastry and egg yolk). Blend thoroughly. Simmer, uncovered for 30 minutes, stirring frequently. Skim any excess fat. Cook until mixture is tender and moist, but not wet. Let the meat mixture cool. Remove potato and mash with a fork. Return to meat mixture and mix well. Check seasoning. Roll dough and line a deep 9 inch pie pan with 2/3 of the pastry. Add the filling. Brush edges of crust with egg glaze. Roll out top crust and arrange on top. Seal, make vent holes to allow steam to escape and brush with egg glaze. Bake the tourtière in a preheated 375 degree oven for 40-50 minutes or until crust is browned. Prepare pastry (Pillsbury) for double crust pie. In Dutch oven, brown ground pork, veal, bacon pieces. Drain-off excess fat. Stir-in chopped onion, celery, garlic, sage, salt and pepper. Stir in 1 cup of water. Bring meat-vegetable mixture to boiling. Reduce heat and simmer, covered, for 10 to 15 minutes, or until onion is tender, stirring frequently. Combine cornstarch and 1/4 cup water. Add to hot meat-vegetable mixture, cooking and stirring until thickened and bubbly. Cook and stir for 1 to 2 minutes more. Remove pan from heat; cool slightly. After mixture cools, line 10-inch pie pan with pie crust. Pour mixture into crust. Top with top crust; cut slits in top crust, Seal and flute crust edge. Bake pie in 400 degree oven for about 25 minutes, or until golden brown. Let stand for 15 minutes before serving. Note: Tourtières are usually enjoyed after the Midnight Mass of Christmas. Step #1 Cut chicken, & pork into 1 inch cubes, beef, & place this in a large bowl. Step #2 Stir in onions. Step #3 Cover, & put in the fridge overnight. Step #4 Arrange salt pork evenly in the bottom of a 3 quart casserole dish with a cover. Step #5 Layer with 1/3 of the meat mixture & 1/3 of the potatoes; season this with salt & pepper. Step #6 Roll out half of the pastry a little bit thicker than for a normal pie & arrange on the potato layer, cutting a small hole in the middle. Step #7 Repeat with 2 more layers of meat & potatoes seasoned with salt & pepper. Step #8 Cover with remaining pastry, & cut a small hole in the middle of that layer too. Step #9 Slowly add enough chicken stock through the hole until liquid appears. Step #11 Bake at 400F degrees F (205 degrees C) for 45 mins, or until liquid simmers. Step #12 Reduce temperature to 250 degrees F (120 degrees C). Step #13 Bake for 5 to 6 hrs more, or until top crust is a rich golden brown. Step #14 Enjoy the Cipate Pie recipe. I am very grateful to Dr. Don J. Landry who published "The Cuisine of Acadia" and gave me permission to reproduce some of its wonderful Acadian recipes on this page.